Wisconsin is home to many great music venues. While their live outdoor music may be limited to the summer, there are no shortages of live music throughout the state year round. From rock, to country, to hip hop, and classical—Wisconsin is a powerhouse of beautifully crafted music venues. The Eagles Ballroom is one of the most popular music venues in the Wisconsin area. This huge space is legendary in the fact that it's supposed to be haunted. There's a VIP balcony along with a lot of standing room to enjoy any type of concert. Shank Hall is a small rock club concert venue. 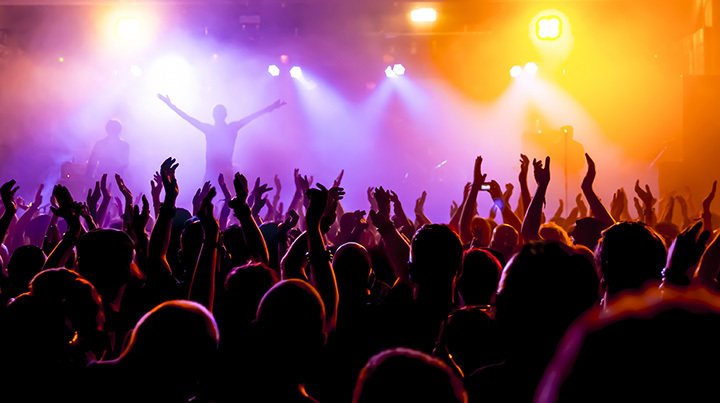 From national to local cover bands, Shank Hall has a diverse lineup that will be sure to please any classic rock fan. Madison's Majestic Theater is Wisconsin's oldest theater-opened in 1906. Over the years it has been used for a number of entertaining clubs. Now it hosts a variety of different concerts of a multitude of genres, several times a week. The Majestic has a great bar area and dancing space as well. The High Noon Saloon is a relatively new live music venue. It features a range of genres, with a nice mixture of big and local bands. The High Noon Saloon has a great outdoor patio in the summer months and features a full bar to keep you hydrated through the night. Located on State Street in Madison, the Orpheum Theater is used today for a wide variety of events like concerts, stand-up comedy, weddings, and private parties. All types of local music and big names play at the Orpheum like the Fray and Switchfoot. Not only does Red Rock Saloon have great music, but it has superb food. Red Rock is located in both Milwaukee and Madison and is a very popular bar that hosts live music very Friday night. Typically the Red Rock Saloon hosts country music stars, both local and national. Alpine Valley Music Theater is located between East Troy and Elkhorn. Alpine Valley is a seasonal amphitheater that was ranked on Rolling Stone's list of "Best Amphitheaters in America." Good food, drinks, and merchandise is available for purchase at this great outdoor theater. This amphitheater is large attraction in the Midwest. Located 40 minutes from the Twin Cities and an hour from Eau Claire this music venue attracts all sorts of crowds. They offer food, drinks, and even camping! On the smaller spectrum, the Barrymore Theater is a live music event venue in Madison. It has an old school traditional vibe. Tickets are generally cheap depending on the event being held. Anything from recitals, to films, to live concerts are held here. Much like the Barrymore Theater, the Pabst Theater is Milwaukee's old school music venue. So much history goes into the Pabst Theater. With its latest renovations, the architecture is sure to wow its audience members. View more Wisconsin Live Music Venues.